Wow! Can you believe its almost February already?! I've had a pretty quiet month in terms of trying new items, but there are certainly some that have stood out to me - old and new. This, for me, is the ultimate brow combo. I have spent so much time and money on finding a brow product which would work for me and for quite some time I stuck with Collections Brow Bar, but I was lusting after the cult favourite - the Anastasia Beverly Hills Dip brow Pomade, I just coudnt bear to spend that amount of money on it. So, you can imagine my excitement when relatively new brand Freedom Makeup, bought out their own budget version which will set you back just £5. I was impressed from the first use; the formula is smooth to apply, easy to control and correct and it truly does make your brows bullet-proof. I have also tried and tested a fair few brow brushes, but thanks to a wax happy therapist some years go, none had a fine enough tip for my barely-there brows. That is, until I picked up my Real Techniques angled eyeliner brush. I got this as part of a set I bought in the Amazon January sale last year and although I did use it a few times for eyeliner I just never thought to use it for my brows. I only actually used it recently because my Bella&Bear Iberian Lynx brow brush was still wet from being washed and it is a perfect substitute. The fine tip is amazing for creating a more full look to my weedy brows and it just picks up and applies my brow pomade so smoothly and neatly. I dont think I'll ever switch this up! Although I dont think the scent carries from the Yankee Candle Votives as well as the Wax Tart Melts, I have thoroughly enjoyed using the 'Cinnamon Stick' votive this month. I keep one burning in the kitchen as it gives out that warm and welcoming scent which I love to come home to, without having sweet undertones which remind of the festive special editions. These give 15 hours of burn time for just £1.80, so I think they are a bargain! Coppery tones are always a staple in my make-up routine as I feel they really compliment my green eyes. I usually place some along my lower lashline, and this month I've been reaching for my MUA mono eyeshadow again. These are an absolute steal at £1 each and the pigment and payoff is outstanding, you really only need a small amount to cover a large area. I've even bought a second one of these in case they stop stocking the shade, as I couldn't be without it! I talked about this mascara in my recent Budget Beauty post, and I still haven't stopped using it. It is truly a miracle in a tube and at £4.50 it is super affordable. I love how long and dark it makes my lashes look and it doesn't flake or dry out which is a life saver. Another plus point for E.L.F products is that they are cruelty free - something which I am becoming more aware of with my makeup and beauty purchases. Another product which I have spoken about before (check my post). This is my ultimate moisturiser - the light, spray formula means it absorbs quickly and easily so your skin isn't greasy or wet for hours, it gets to work quickly and gives beautiful results, plus the tropical coconut scent is ultra refreshing and revitalizing. I had been desperate to get my hands on this since September last year but I found it hard to come by in store and online towards the end of the year, however, I eventually found it in my local Body Shop and I had £5 to spend on my loyalty card so I got it for only £3, but it would have been worth every penny even if I payed full price! As much as I love my Vera Wang Princess perfume, I prefer to have a lighter scent to hand for those relaxed days, and I found the answer in Soap&Glorys Sugar Crush Body Spray. If you've ever smelt any products in the Sugar Crush range you'll know just how addictive it is - the perfect balance of zesty citrus and sugar sweet - so it's no surprise that I am already needing to get a new bottle of this! Which things have brightened up your January? For my second 'Style watch Wednesday' post, I am focusing on a lady who I am developing a serious case of #wcw for! Vintage style is so glamorous and I admire a woman who can skillfully and elegantly pull it off. Miss Victory Violet does exactly that and today, I am sharing my love for her one of a kind style! As soon as I saw Miss Victory Violet post this outfit pic on her Instagram, I fell in love. Although I'm no good at creating a vintage vibe myself, this is really something I can imagine wearing. It looks classy and comfortable and the colour is just my favourite! I love the length of the sleeves and I think the way Miss Victory Violet has added a brooch to the cutout neckline is just darling! I love the cute shoes and how the accessories match with them to pull the outfit together and make it more of an ensemble! 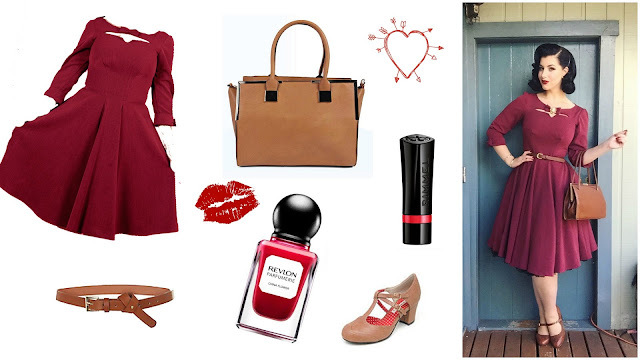 And, what would any vintage get-up be without those staple red lips and nails? She can seriously do no wrong! This, for me, is the epitome of pin-up. I love the mix of patterns and fabrics. The length of the skirt is ultra flattering and the waist belt gives that gorgeous hourglass figure. I think this would look just stunning on a spring walk and lunch with friends! I love the way Miss Victory Violet has finished the outfit with this darling headscarf and the staple red lips are, once again, on point! I also found this amazing set from Claire's Accessories to help you get those ultimate victory rolls! Although these particular pieces are out of my price range, I still dream of wearing something like this. I am furiously searching every corner of the internet for something just as beautiful but in more of a budget price range! I would love to wear this style of clothing everyday, but for now I am just going to rock it on special occasions until I learn how to properly master it! Miss Victory Violet is the ultimate Pin-Up and I look forward to getting vintage inspo from her daily through her Instagram feed, and by reading her 'my week in outfits' posts on her blog! What do you think of the Vintage fashion trend? Ferrero Rocher Giveaway - WINNER ANNOUNCED! It's finally time! After 14 days and over 150 entries, I am so excited to finally announce the winner of my Ferrero Rocher giveaway! I absolutely loved reading all the kind comments you guys left about who you would share your winnings with - and I admired the honesty of those who said they would rather have it all to themselves!! Congratulations Girl! I hope you thoroughly enjoy this amazing prize! Don't forget you have 48 hours to send your postal details to emmahobbsie@yahoo.co.uk - these will be forwarded on and your prize will then be sent out! Thankyou to everyone who entered and I'm looking forward to bringing you another exciting giveaway very soon! I would also like to thank the lovely people at Cohn& Wolfe and Ferrero Rocher for allowing me to host this fantastic giveaway for my readers! I have been a fan of E.L.F cosmetics since I tried them a few years ago; they offer fantastic quality makeup at an affordable price, none of their products or ingredients are tested on animals or made from animal derivatives, and they even have their 'Essential' and 'Studio' lines to fit in with all budgets. For Christmas, I suggested to Dan that I would like to try the ELF Bronzer palette, but he was so, so sweet and surprised me with a whole selection of ELF goodies - best husband ever! He really impressed me with his choices - it just shows how well he knows me! I really wanted to get my hands on this as I have finally come to the end of my beloved ELF studio contouring blush & bronzer duo and I was looking to try something new and a bit more versatile. The ELF Studio Bronzer Palette houses 2 matte and 2 shimmer powders in a variety of depths and shades so that you can contour and bronze yourself accordingly year round. I was so impressed with the pigment of these powders, you really only need to work one sweep over the face for a good flush of colour but, of course, you can build the colour if you have a darker skin or prefer a deeper glow. I'm not usually a fan of shimmer bronzers as I feel they can leave you looking a little heavy and sweaty but the shimmer particles in these are very small and subtle - perfect to give you a summer glow year round aqnd I have enjoyed using them so far. The powders are presented in a sleek black square with a large mirror inside. I think the packaging actually makes the product look very expensive and the minimal text on the front keeps it sleek and current. Overall, a wonderful palette which allows you to create custom colour at a (very!) affordable price. I dont usually use bright blushes like the ones featured in the ELF Studio Blush Palette, and I was a little nervous the first time I used it - but I was actually pleasantly surprised. The colours are builable to your specific style and you can blend them to create your perfect custom shade. I like to blend the top 2 shades for a healthy glow with a delicate flush of colour. The powders are silky soft and apply like a dream, plus, there is something for everyone as the palette holds 2 matte and 2 shimmer blushes. I think the darker pink shades will work well when I have a summer tan, but for now I'm sticking with the lightest shade! I like the fact that the packaging matches with the Bronzer and Illuminating palettes - it means these look amazing when stacked together on my vanity. To be honest, I probably wouldn't have picked this for myself but I was pleasantly surprised when Dan gifted me it and I have really enjoyed using it! I really liked the look of this palette when I saw it on the ELF website and I was absolutely delighted when I opened it on Christmas morning. I've never really been able to work so well with liquid and cream highlights so it's wonderful to own a palette with a nice variety of colours in powder form. The powders are made to give a soft-focus finish, so you have a natural radiance once you've applied them. I like to use the champagne and gold highlights most as that is what I would usually go for, but I have also enjoyed using the pink and white ones to give an open look to my eyes. The only thing which I would have to put a negative on about this was that the packaging doesn't quite match up to the Bronzer and Blush palettes - the 'e.l.f' text seems to be much larger. This isn't a big problem of course, it's just a shame that everything in the line doesn't match up. Lipstick is something I am getting a real love for. I have started to collect a few and I was very pleased to add this to my collection. I just love the sleek, sophisticated look of the packaging; its square and black giving it a more expensive look. The pigment of 'Beautiful Berry' is strong and it applies smoothly and evenly - gliding on for soft, moisturised lips. The longevity is fair. I love the fact that all of ELFs mineral products are made without parabens, preservatives and chemical dyes. This lipstick just includes the good stuff like natural oils, waxes and vitamins, which equals healthy lips year round. Although Dan had treated me to the Blush palette, I was still pleased to find this in my stocking as it is unlike any of the colours included in the Blush palette. 'Mellow Mauve' is a dusty, muted shade with an opalescent shimmer finish which gives off the most beautiful glow - however I do find that it works better with some eye looks than others. The pigment is delicate with this shade so you do need to work with it and build it up, but I don't mind that as I wouldn't want to end up with too much of the shimmer on my cheeks right away! All that said, the powder is soft and easy to apply, it doesn't leave you looking patchy and it doesn't dry the skin out, so it is a nice product. If you know me well, you'll know I love mascara. Even a simple slick on a lazy makeup day can open the eyes and make you look wide awake. I have tried mascaras from all sorts of brands, for all sorts of prices, offering all different results, but I have truly never met a match for the ELF 3-in-1 mascara, its even better - dare I say it - than my Urban Decay 'Perversion' mascara! Shock horror! The 3-in-1 mascara promises to lengthen, define and volumize lashes. It sounds like a dream in a tube doesn't it? While it does take a couple of coats to get a volumized look, it certainly delivers on the lengthening and defining part. I have honestly never owned a mascara as great as this, and if you don't believe me just read the reviews on the product page! This doesn't flake or dry, leave your lashes stuck together or leave marks around the eye area, it just effortlessly glides through your lashes leaving them super black, super long and super pretty. It even has a little ball end on the brush so you can get right into the corner of the eyes to catch every single lash, every single time. I own a few powder and blush brushes - the Real Techniques ones are my favourites - but they are all fairly large and full, so when Dan decided to treat me to this one by ELF, he was onto a real winner. The smaller bristles and the tapered edges make it a dream for creating a sculpted face with my bronzer and blush combo. The bristles are soft and made to be anti-bacterial, so the brush is less likely to harbor harmful bacteria - you should still wash your brushes regularly, though! I like the sleek design of the handle and the black colouring means that this brush fits in well with the rest of the ELF 'Studio' line. This brilliant brush is affordable and a must-have in any makeup collection. I was very pleased with everything Dan treated me to, and each item only cemented my belief that E.L.F really are a brand that have pulled off budget beauty successfully! What are your ELF faves? I've never really had a particular style, I just wear what I like, and what I feel like wearing. I find inspiration in all sorts of places, so I decided to start a Style Watch weekly post to help explore the world of fashion! If you know me well, you'll know I am an unashamed Spiderman nerd, and having watched the Andrew Garfield/Emma Stone movies nearly a 1000,000 times, it's safe to say I have analysed every aspect. One thing that stood out to me from the first viewing, was the 'Gwen Stacy' wardrobe - it is perfect. Comic book style, yet wearable for everyday life. So, I've decided to focus my first 'style watch Wednesday' on Emma Stones impeccable Gwen Stacy. This was arguably the most talked about outfit of Gwen's seen in the movie. It was one which die hard Spiderman fans would have recognised from the comics, and it hints at big storyline events (I wont spoil it for you!). I, however, liked it for other reasons. I love the mix of fabrics and colours - the soft, flowing blouse, the aubergine skirt with hard edge pleats, and the edginess the patterned tights bring. Gwen accessorises this outfit with her famous seafom green coat, which I have found a replica for. It would be well worth the money if you were wanting to complete your own Gwen look. I read an interview with Ve Niel - big time Makeup artist who worked on 'The Amazing Spiderman' movies - and she mentioned that she used the MakeUp Forever HD Foundation on set for Gwen as it has great longevity and gives a youthful glow! 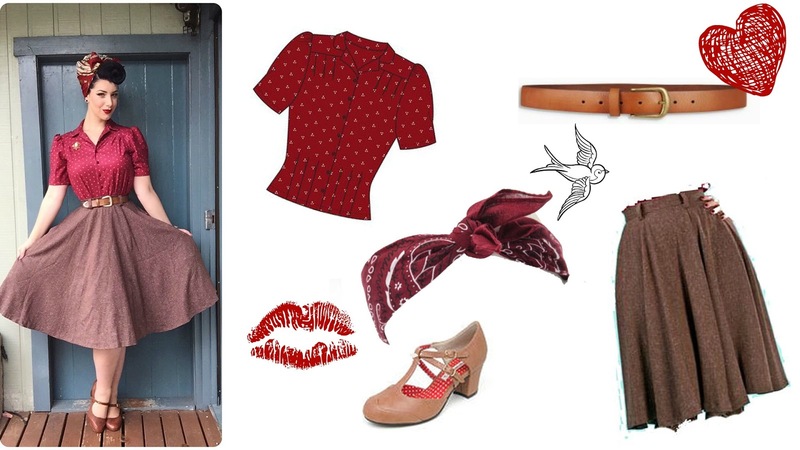 For a more casual / street style take on the Gwen Stacy look, I looked to this outfit. I love the laid back feel mixed in with pops of contrasting colours - this is something I would never think to do myself, but it actually looks brilliant! The slouchy beanie keeps the look young while the blazer pulls it together, making it a perfect 'dinner-with-friends' ensemble. I love the use of colour and I think this is something I would like to try to do with my own outfits. There are an endless list of beautiful Gwen outfits throughout the two 'Amazing Spiderman' movies, but these are just two of my favourites. The mix of fabrics, textures and colours makes for a memorable, yet wearable outfit and the simplistic makeup gives you a youthful aura. 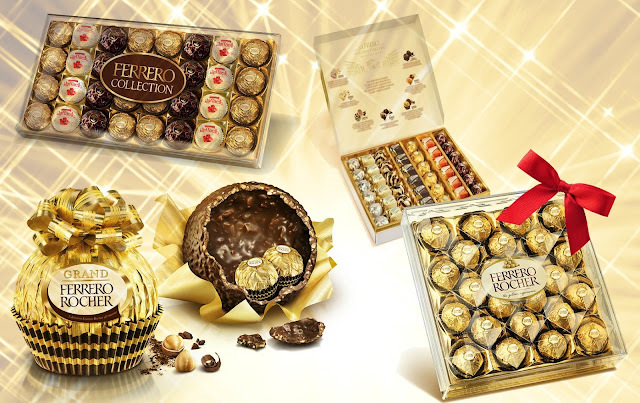 You might remeber the post that I wrote over Christmas all about the amazingly decadent Ferrero Rocher hamper I was so kindly sent. Well - good news! So many of you loved the post, and wanted to get your hands on some of the goodies for yourself, that I have now teamed up with the lovely people at Ferrero Rocher to give one of my lovely readers their very own bundle of Chocolaty goodness! I am going to make the giveaway super simple for everyone to enter - all you have to do is leave me a comment telling me who you would share your Ferrero Rocher bundle with and why! For extra entries you can follow me on Twitter, Facebook and Bloglovin' - but this does not guarantee you will win, so don't worry if you don't have an account on all of these platforms.
. The Giveaway will run from Monday 11th January 2016 and will close at Midday on Monday 25th January 2016 - so you have 2 weeks to enter.
. The winner will be announced across all my social media on Monday 25th January 2016.
. Winner will have 48 hours to email their postal details to Emmahobbsie@yahoo.co.uk before a new winner is selected. .Winners details will be passed on to Ferrero who will then send out the prize. Good luck everybody, I cant wait to read your comments! As much as I love to indulge in new beauty treats I have come to the conclusion that I have other things which I need to be saving for from now on - Elias' 5th birthday to Disneyland for example. So I have decided to put together a list of a few things I would love to own, which I am able to buy throughout the year without feeling guilty about. I am going to try my hardest to stick to just the items on this list - although there may be additional treats occasionally; you all know how much I love a limited edition or seasonal collection! The Jeffree Star liquid Lipsticks have been on my wishlist for some time and although 'Celebrity Skin' seems hard to get hold of I really want to get my hands on one and try it out. The formula is apparently budge-proof and the matte finish is so beautiful, I also like the fact that it is 100% vegan and cruelty free. I have never tried anything by Flower Beauty before and although they are listed as only available at Walmart I have seen people selling them on Ebay and Amazon, so it shouldn't be too hard to pick one up. 'Set me Freesia' is a darling rose lip colour which I think will work wonderfully through the spring and summer months. These promise intense colour payoff and are very affordable so I am eager to see if they live up to expectations. We've all heard of MAC before so this may not be a surprise addition to my list. I have wanted to try their lip pencils for some time and although I think they are quite over priced, MACs 'Subculture' looks like a shade that I could mix and match with a lot of lip colours or wear alone - so hopefully I would get the moneys worth out of it. Ever since wedding prep where I invested in a few higher end foundations I have really seen what the fuss is about with them. I love the coverage and longevity of a higher end foundation and I would really like to try Urban Decays offering next. I have been impressed with every other Urban Decay product I have tried so far, so I cant see this being an exception! I tried a sample of this English Laundry Perfume in my first Birch box. It has the most wonderful floral scent, like a rose garden in the summertime. The 50ml bottle is a little more pricey than I'd usually spend on a fragrance, but given that it is quite a strong scent a little would certainly go a long way, so I think it would last well. I have used various Bourjois products in the past, from base and face to nails and have (nearly!) always loved them, so this Rouge edition lipstick is definitely worth a try. The glossy finish and the deep plum tone will work well during the late summer months and the autumn and I think its a nice alternative to all the berry and red lip products around at that time of year. Even though I don't wear them as often as I used to, I do still love a good pair of false lashes. I tend to go for your-lashes-but-better styles so that I can wear them on days out or dress them up a little on (rare) nights out. These 'Lovely' lashes by Foxylocks look super natural and comfortable - and the price is good too. Of the few Gerard Cosmetics lipsticks I own, I have enjoyed them all. I have tried a variety of finishes and shades and 'Dragon Berry' is set to be my next choice. I love the look of the colour, it is a beautiful purple with hits of pink, making it perfect for wear through the summer months. The satin finish, although not particularly long lasting, is super comfortable to wear and the gold chrome packaging is second to none. Cowgirl Dirt is a new brand to me. I discovered it on my searches and, being a country girl at heart, I fell in love with everything. Really the only thing stopping me ordering is the shipping. With any international order there is the worry of duty taxes but I am hoping that if I order just the Yeehaw Lipstick in 'Trigger' then I should be okay! The Yeehaw Lipsticks are full of moisturising ingredients and have a light citrus flavour that I am just dying to try out. Another Lipstick! I'm addicted, I know. I think that a good lipstick can take even the most simplest of makeups to the next level and now that I dont have a lot of time to sit applying a full face, Ill take any help I can get. The L'Oreal Color Riche Lipstick in 'Ginger & Chocolate' looks like the perfect 'pull together' shade. It doesn't look to dramatic, nor too bland that it'll blend in with the lips. I think this will be a great all rounder and I look forward to owning it. If there's something I am needing to try more of, it is eye products. I tend to stick to the same matte nudes, but the MUA Luxe 'Smoke & Smoulder' eye primer looks like a good place for me to start stepping it up. This revolutionary little gem can be added to any eye shadow to give it a gorgeously elegant smoky finish. Back to the lips again! I have been slowly growing my MAC lipstick collection, and although it is still modest, I have enjoyed what I've tried. 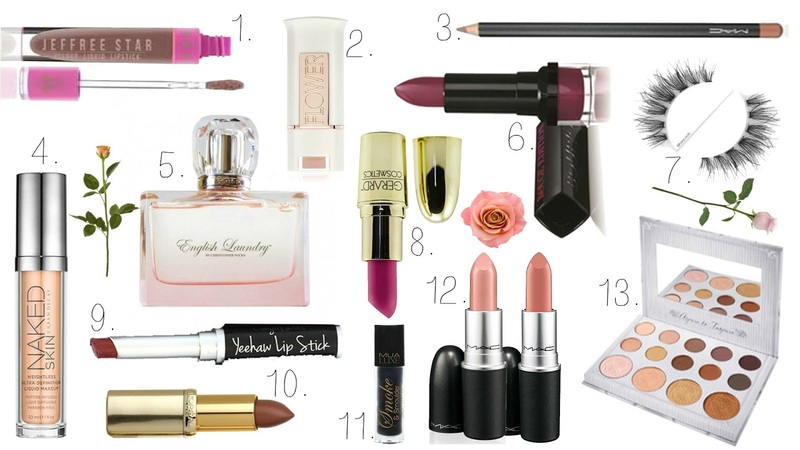 Because these lipsticks are a little more expensive than the ones I usually buy, I am adding these two neutral shades to my wishlist to ensure I will get maximum use out of them. 'Honey Love' and 'Peach Blossom' are both shades that will work well through all seasons and with a variety of eye makeup looks. Finally, a palette I have been lusting after since its release but seemed to always be out of stock. Now that the hype has died down, the Carli Bybel palette by BH Cosmetics is always in stock and, best of all, its super affordable. There are a mix of blushes, bronzers, highlights and eyeshadows in a variety of finishes and I have read nothing but good things about this. Once again, the only thing that has stopped me from ordering is the shipping costs, but I have ordered from BH Cosmetics before and I have to say that their shipping costs were fair. I am happy with my 2016 Beauty sticklist and I am going to try my hardest not to stray from it - it's nice to own new products but I think it is going to be nicer to have days out with my family this year and make memories that will last forever. Although this blog is still predominantly beauty focused, I am going to integrate more personal posts this year so I can share my life with you, my lovely readers, and you can get to know me better! What is on your 2016 Wishlist? We are almost a week into the new year and, although winter is still in full force, I always feel so fresh, excited and motivated this time of year! I admit, it is hard to feel inspired, motivated and passionate when there's a ton of leftover naughty food lying around and the weather outside is still dull and dreary but there are a few simple ways that can help to turn that around. I want to clarify that I'm not talking about loosing weight or getting fit, there's no 'New year, new me' here, simply 'New year, better me' and I am kick starting that with a few feel good ideas. This is the easiest way to relax and make yourself feel fresh. Lighting a candle with your favourite scent and lying back with a soothing face pack can immediately lift your mood and leave you feeling renewed and ready to go. As much as I love all of the baked good, sickly sweet scents of the festive season, I am reaching for fruitier and lighter scents at the moment. Scents that fill my head with dreams of far off lands and inspire me to get going. Yankee Candle always offer the most amazing fragrances and my favourites for this time of year are 'Sicilian Lemon','Pineapple Cilantro' and 'Peach Smoothie. On top of this, all of the indulgence over Christmas has done nothing for my skin, so it needs some extra TLC now more than ever. This oh-so refreshing Creamy Coconut face mask by 7th Heaven is all I need and more, but any face mask will do really. Your skin can release all of those nasty toxins, leaving you clear, clean and fresh. Body brushing is something I only learned about last year but it is very soothing and actually very beneficial. As well as removing dull, dead skin cells, the brushing motion can aid in positive circulation leaving your skin glowing and smooth. I try to body brush each morning when I get up to get me energized and ready for the day! I follow my body brush with moisturiser. My favourite right now the BodyShop Coconut Body Milk, it is so light and refreshing and the tropical scent is perfect! This product absorbs almost immediately too, so its great for those who are on the go. I find having a light scent spritzed over me throughout the day so energizing and revitalizing. At the moment I am loving Soap&Glorys Sugar Crush Body Spray. The sweet citrusy scent is additive and makes me feel so awake and alive, plus the 100ml is the perfect size to carry in your handbag. I am starting to pick up yoga again after taking about a year off during my pregnancy and while our baby was young and very reliant. He is a little older now and has settled nicely into a routine which means I have an hour or so to myself each day while he naps, in which I like to do my yoga. I do it all at home with minimal equipment - a mat and resistance band is all I need, plus my Louise Solomon DVD. I find Louise's routines simple to follow and her voice is so soothing and relaxing. She offers a range of DVD yogalates exercises to suit different capabilities and needs. My favourite is the 'Energizer' which I like to do in the mornings to stretch my body and wake it up gently, however there are other options which are perfect for evening wind downs before you go to bed. I find that I sleep so much better when I practice yoga and my body feels so much more active and healthy. I picked up the pictured motivation cards in the Matalan sale. I cant seem to find them on the website now, but you can find similar ones here. I have placed these throughout my new Filofax planner for inspiration and a boost when I need it. I think they are so pretty and they are a great reminder that you are capable of doing all the things you dream of! Alternatively, I think these would look wonderful framed in an office or throughout the house. Having a notebook and planner is essential for me through the year. I find noting things down and crossing them out as I complete them keeps me motivated and on a mission, especially in the early months where everything seems like a chore. I picked up this cute gold and white chevron notebook super cheap in HomeBargains but any one will do. I have also spent a lot of time setting up my new planner - which I will do a post on soon - it will help me stay on top of things and see that I complete things I aim to do this year. I have sections for my weekly life and plans, my blog schedule, money saving and I have just found a wonderful Bible study page to add to it! However you decide to leap into this New year, I hope you feel fresh and ready to go. Dare to dream, get out and do things, achieve, inspire and be yourself! Now and then we all need some time out. My favourite way to do this (when I get a quiet moment) is to read. It's rare that I should read a story - 'Water for Elephants' being the exception - I prefer a different kind of book. One that takes you into the mind of someone creative and daring. One that inspires and motivates. One that leaves me wanting to turn every last page until they are old and worn out. I have always loved the world of cinema, it is a long time dream of mine to be part of a big budget movie, or a theatre production for that matter - yet I never liked to know how the magic was made. I wanted to keep it a secret so I could pretend that these far off places existed and these amazing adventures were just waiting to be had. Then Dan came along. His career in Animation and CGI relies on creating the magic - so that world was revealed to me, too, and it was more exciting than I could have ever imagined. I still don't like to know which parts of a movie are a set and which parts are real - I want to keep that a secret still so I can visit those places in my daydreams, but I love to discover how every other part is imagined and created - and that is where our book collection comes in. We collect 'art-of' books. Behind the scenes treasures that show appreciation to the people who work tirelessly to create the films we know and love. It's amazing to see how things progress from a mere sketch, to a storyboard, to a painting, to a living film. For example, did you know that for each 8 seconds of on screen animation, it took animators a week to sync characters mouths and facial expressions to actors voices in the original 'Toy Story' movie. Or that it took a team of 650 people 3 years to create 'Frozen' - and that they had to invent completely new computer programs to design the film and its characters and get it to the big screen? Things like that is why I am in love with these books. You get behind the story and learn what it takes to make a good film into a great film - and how much hard work goes into it. You see sketches and ideas that would otherwise have gone unseen and unloved. You see how films could have been - and wonder if you'd have loved them so much. You discover characters or costumes that didn't make the cut and how ideas and plots developed to create the story you could delve into again and again. 'Tangled' is one of my favourite Disney movies, so this book is just perfect for me. Dan surprised me with it for my birthday last year and it has become a firm favourite in our collection. This book is filled with character developments; where you can see how different artists envisaged Rapunzel and the different mediums they used to create her, scene setting; to find out about how Rapunzel's tower was imagined up as well as the kingdom and the castle, and plenty of concept art, too. The book is split into sections and is beautifully illustrated with full page images as well as story boards and sketches galore. This underrated movie (featuring the voices of Johnny Depp and Bill Nighy among others) is one of mine and Dan's favourites and I bought him this book for his birthday last year. It starts with a foreword from the movies director and is filled with amazingly detailed sketches, concept art pieces and much, much more. This film, although strange, is visually stunning - from the feathers on the birds, to the scales on the reptiles, it is unbelievably detailed for an animated/CGI piece and it is so inspiring to see the creative process it went through. This is the newest addition to our collection which Dan treated me to for Christmas. 'The Amazing Spiderman' (1&2) are part of my top 5 favourite films and I was so excited when I unwrapped this. Dan said it was pretty hard to get hold of and it comes in an impressive hardback slip case. It is absolutely bursting with information and details; Storyboards, cast interviews, movie stills, production and development, concept art and so much more. I'm sure people in 'the business' could get a lot more out of these books than I do, but I still love to read and own them. I am looking for more books to add to our collection - I have bought Dan 'The Art of Big Hero 6' for his birthday later this week and I cant wait to see his face when he unwraps it! I also want to own 'The art of Ratatouille', but please do let me know if there are any others you would recommend! What are your favourite books, and do they help you to escape?